Perfect cleanse if you are new to juicing. Focuses around eliminating toxins. Will help restore overall wellness. Provides your body with a large amount of vitamins and minerals. 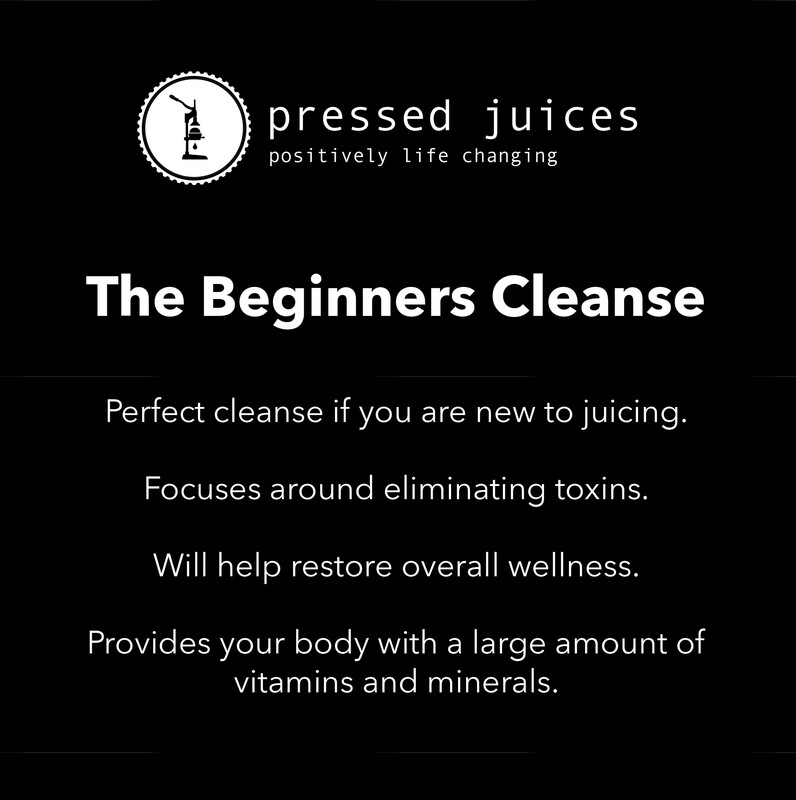 Pressed Juices designed the beginners cleanse for those that are first time cleaners, new to juicing that are looking for a gentle detox, breaking bad habits, something that offers an extra boost of flavor and still provides the overall benefits to your body. Cleansing provides a number of benefits to your body by increasing hydration, allowing the digestive system to rest and re-set helping you to reap benefits such as: eliminating abdominal discomfort, clearing skin, brightening eyes and helping you to return to an energized state. Juicing allows an easy nutrient absorption into the body. Our everyday lifestyle contains toxins from multiple areas such as: pollution, chemicals, plastic, alcohol, caffeine, medications, simple carbs, pesticides and preservatives to which, can build up in the bodies system causing a range of symptoms. Symptoms, which may include the following: feeling run down, headaches, sluggishness, stressed, problematic skin, mood swings, cravings and a weakened immune system. By allowing our body time to heal especially our liver, a juice cleanse can get you back to a state of well-being. The beginners cleanse essentially focuses on eliminating toxins from the body through focusing on nutrients with the objective to reduce bloating & inflammation, fight away free radicals, promote gut healing along with liver cleansing. The detoxification process does not require you to consume a bunch of pills and potions however it does require many micronutrients that can be simply found in foods. Nutrients including: B vitamins, Vitamin A, Vitamin C & essential fatty acids to name a few. Our cold pressed juices are filled with fresh fruits, vegetables and nut mylks that contain live enzymes enabling your body to easily absorb the necessary nutrients.